Quite. L-39ZA is one of the best cards available to a Czech deck. Comes at 3 veteran, does kill helicopters rather reliably AND cannot be avoided by the other guy landing the helicopter because the Albatros can ground attack the spot with 500kg bombs. This is important if you catch a helicopter unloading troops and know that you wont be able to gun down the heli before it lands. Also, the Albatros is slow, its bombs are slow and it is possible to change targets quite late into the bombing run (unlike the horrid MiG-29 9-12A that must have targets set pretty much from the moment it leaves the spawn or it won't drop the bombs). Also from my experiance (1v1 ranked, usually Maj - Col range), Czech air tab feels not weak at all. I would even claim the contrary - Czech air force can reliably outperform other air forces as long as the other guy does not have two cards of ASFs which is very rare. And you should avoid air fights above the enemy air defense because ECM is something noone ever heard of in Czechoslovakia. http://tw.greywool.com/i/HSM5Y.jpg This is my deck for ranked - depending on my ragequits I exchange Su-22M4 for Su-25 from time to time, but the rest stays. In most games, I seem to be able to achieve absolute air superiority and the key is - of course - spamming and screening (you have a grand total of 9 planes able to engage air units, 12 if you count Albatroses). I pick L-39 as more or less a starting unit and send it against the enemy to probe for possible heli rush, to kill some SAS or Ka-52 etc. If enemy picks a starting ASF, L-39 dies. Nothing dramatic. The second plane is either MiG-23ML if enemy has any plane, or MiG-29 9-12A if he does not. MiG-29 9-12A is maybe a better option because it often pushes the opponent to buy an ASF of his own to counter it. At that point, you simply buy a cheap MiG-23ML (and thus have L-39ZA, MiG-29 9-12A and MiG-23ML), lure his ASF to engage either the 29 or 39 and shoot it down. Even just Albatros + ML is a combo capable to defeat just about any enemy ASF as long as it is not Rafale or other similar prototype. The point is that Albatros lures the missiles (and often does little damage itself) and the ML kills (it has very good SA missiles considering its elite veterancy). If you are not tight on points, it is good to buy a pair of MLs (as 200pts is not all that much) and surprise his ASF. As soon as you shoot down one of his ASFs (considering he most often has 2 or 3 on the card), you have basically won the air game, because every ground attack plane you buy (MiG-23BN and MiG-29 9-12A (and maybe L-39ZA but it is questinable due to its speed) can be used to fight planes and complement the MLs. As strange as it sounds, Czechoslovakia's multiroles are actually wonderfully multipurpose due to their numbers. There is nothing like swarming an F-15C with 2x BN and 2x 9-12A. And you still don't technically pay for them because you use these planes for ground attacks (also, 9-12A has nice rearm time; and 9-12A is also amerikanskyi shpion because that is the only explanation for its 40ECM). Also, if you loose any plane, nothing happens because you still have tons of other planes. And if you reach a critical mass, you can steamroll nearly anything in the air. STROP 2 wasn't put into service, but Slovak army continued the project, developed new FCS and changed Strela-2M to Igla. If I understand correctly the real life designations, PRAM-L Vz.82 is the basic (towed?) version, while PRAM-S Vz.85 is the vehicle mounted mortar. Entire group of MiGs cost too much. If you just wanna intercept a occasional bomber, Polish MiG-29 would perform much better. 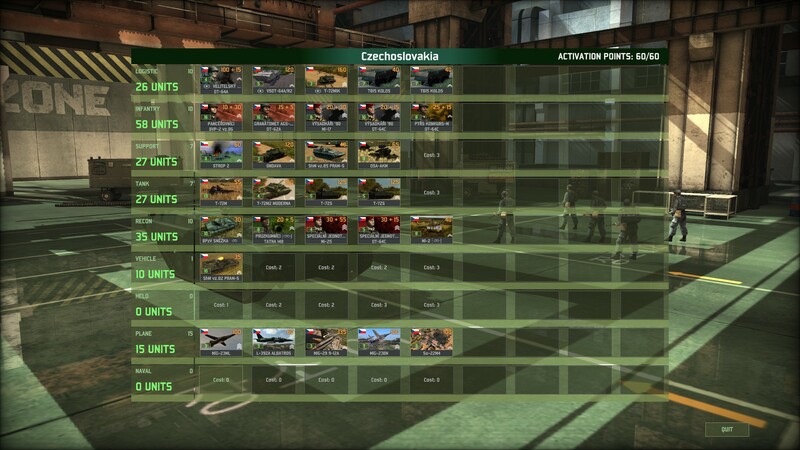 And Polish loadout is realistic to CSSR one. This is something I was writing on forum for some time, including the 1s on Vympel. Compared to some J-8C (100pts) or Viggen (105 pts), MiG-23ML is bad. A pair of STROP 2, yeah, but that is not stuff for armored deck, which needs a Longbow protection even more than decks that allow STROP 2. Albatros comes with high veterancy and does a lot of damage with gun, because it is slow and has plenty of time to pump the rounds. One is often enough to shoot the helicopter down and if not, then at least the helicopter is not in condition to fight. Also, I forgot the Avia S-105 in your description. It doesn't fire a burst like it did before, it is completely useless. If the burst comes back sometimes, I might consider taking it for anti-helo role. As BenKenobi just wrote, CSSR has high numbers in plane tab and is very strong with bombers. But when not playing 1v1 (I prefer 2v2 or 3v3 games), MLs are very bad.